We've seriously gotta talk about this click-bait problem of yours. I mean, yeah. I get it. 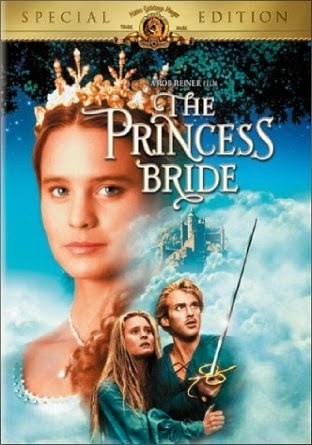 The Princess Bride is awesome, and we all love it more than is probably healthy, but come ON. Why would you subject yourself to some stupid list written by someone with a chip on his shoulder, who was probably repeatedly dropped on his head as a child? Maybe you thought, "Is there really someone out there who is that insane - the internet's last madman?" But I assure you, I am not insane, and the internet is still rife with madmen (There are a few madwomen, too, but not as many as men, because men apparently have glandular issues that make them act like jerkwads all the time). What is going on here is that someone (namely: me) has figured out a way to activate some sort of emotional response in your amygdala, in order to bend you to his will. Now, this is not a bad thing in and of itself. For example, I just finished writing my second novel, and not only did I work hard to ensure that the first line of the book would hook you in and make you want more, but I also tried to end each chapter with a line that'd leave you desperate to turn to the page and find out what happens next. I did this because I wanted you to feel yourself being pulled inexorably, rhythmically through the pages to a glorious, climactic, shout-out loud finish that would leave you weeping for joy and (possibly) craving a cigarette. Here's the difference, though. When I wrote each chapter-ending "click-bait" line, I did my darndest to fulfill what was essentially a promise. I made a covenant with you that if you'd trust me and keep reading, I would make it worth your time. And I would resolve the tension I'd created with that "promise-line" of mine. People who write click-bait lines on the internets don't even bother to try to follow through on the promises they're making, because they don't care about their integrity, or about you. They aren't trying to give you a satisfying, creative experience... they just wanna use you for your click-finger. This troubles me not just because they are liars and their pants are on fire, but also because they're increasing your cynicism about promises. Click enough times only to find that what happens at 1:54 does not blow your mind (and actually isn't any different than the rest of the video), and you'll eventually stop believing that anything could blow your mind, ever. You'll be so sick of lies that end with a whimper that you'll lose your capacity to wonder - to chase mysteries into the unknown. Please, just stop following click-bait. If you can't help it, get off the internet and go read a book, or something. Or at least deflect that attention to the "Saved You A Click" website, where they reveal the answers to those burning lie-questions these click-monsters keep throwing at you. But for the love of everything good and decent, stop clicking your way around the internet, trying to get your jollies making fun of some idiot too stupid to admit that The Princess Bride is the frickin' cinematic masterpiece of the whole past century. Anonymously lobbing insults is sophomoric. "Sophomoric" is synonymous with "foolish." "Foolish" is synonymous with "idiotic." You anonymously lobbed an insult. *Note: this syllogism brought to you courtesy of an Intro to Logic class I once took, and almost failed. Draw your own conclusions. Funny because I actually Googled "Princess Bride overrated because I find that film overrated"
Or... maybe some people just honestly think the film is overrated? It's kinda funny -- you're basically shouting "inconceivable!" to a perfectly sane opinion. I don't think that word means what you think it means. It's not click bait if it's a sane opinion. What a strange and pointless article.